Srah Srang is a baray, or reservoir, that is located south of the East Baray and east of Banteay Kde. Srah Srang was created by excavation in the mid-900s and, while there are several theories, it’s not clear whether the significance of this reservoir was religious, agricultural or a little bit of both. However, Srah Srang is best known as an ideal location for viewing the sunrise. At present Srah Srang measures almost 2,300 feet (700 meters) by almost 1,200 feet (350 meters) and is still partially flooded. A basement was found in the middle of it, which suggests that there may have been a temple on an artificial island at some point in the past. 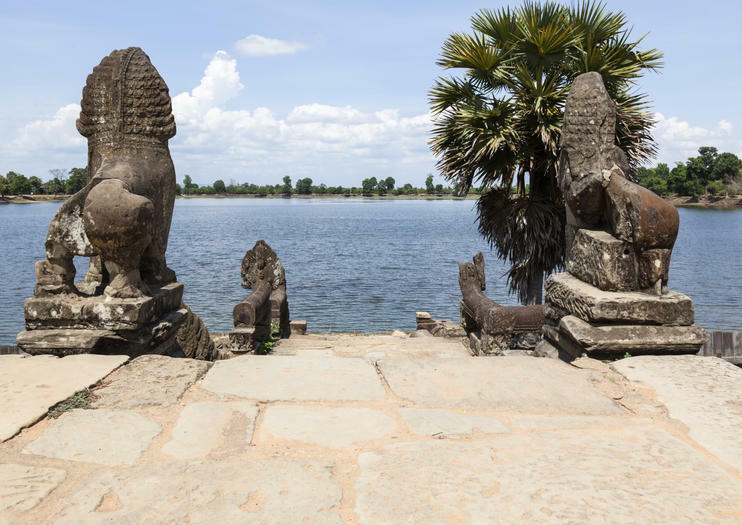 The landing-stage is located opposite the entrance to Banteay Kdei and is bordered by naga balustrades, ending with the head of a serpent mounted by a garuda with unfurled wings; guardian lions watch over the steps that lead down to the water. Srah Srang is part of the Angkor Wat site and is accessible whenever Angkor Wat is open. Due to its popularity, it can often get crowded at sunrise. Save the hassle of visiting the ticket office by buying your 1-, 3-, or 7-day Angkor Archaeological Park pass in advance. Rather than waiting in line to purchase your pass on the day—particularly inconvenient if you’re heading to Angkor Wat for sunrise—your pass is delivered to your hotel the night before your visit, meaning you can go directly to temples such as Ta Prohm and Banteay Samre without wasting time. Discover the mysteries of Angkor on this full-day, small-group temples tour from Siem Reap. See the iconic Angkor Wat and the enigmatic faces of Bayon temple. Wander around Ta Prohm, where the trees are intertwined among the ruins, and enjoy a traditional lunch at Sras Srang -- the Royal Baths. This is a perfect tour for those who want to see the highlights of the Angkor temples in one day. Get an early start to watch the morning light splash over Angkor Wat’s triple towers, a fantastic beginning to your full-day bicycling tour among the ruins of the Angkor Kingdom. Your local guide leads you through the Angkor Archaeological Park, showing you several iconic temples in the sprawling complex. Stop to stroll around different sites and examine intricate stone carvings and statues. Your small-group tour is limited to six participants, and includes a Western breakfast and Khmer lunch, and round-trip transport by minivan from Siem Reap. Delve into the mystifying history of Cambodia’s sacred temples and ancient archeological sites on a 3-day adventure from Siem Reap. Immerse yourself in Cambodia rich cultural heritage and discover the awe-inspiring temples of the Khmer Kingdom; marvel at the ancient structures of Angkor Thom and Angkor Wat; and hike into the dense depths of the jungle on an excursion to the River of a Thousand Lingas. Cruise around a UNESCO World Heritage-listed Biosphere and enjoy an intimate atmosphere on this small-group tour, on which numbers are limited to 12 people. Already seen Angkor Wat? Explore more of the UNESCO-listed Angkor temples on this 4-hour off-the-beaten-track tour. Marvel at the Buddhist temple of Banteay Kdei and enjoy stunning views of the Srah Srang reservoir. Then, venture into the overgrown jungle temple of Ta Prohm, famously used as a filming location for Angelina Jolie’s Tomb Raider. This private tour includes hotel pick-up and round-trip transport. Rather than exploring Angkor Archaeological Park in a large group, opt for a personalized experience of the UNESCO World Heritage Site on a small-group tour that provides a perfect introduction for first-time visitors. You’ll travel between the dispersed Bayon, Ta Prohm, Angkor Wat, and Angkor Thom with ease, and enjoy the convenience of hotel pickup and drop-off. Supplement your visit to the famous Angkor Wat on a private tour to the Angkor Thom complex. See even more temples including Preah Khan, Banteay Prei, Ta Som, and many more as you follow your guide through the complex. Enjoy a hassle-free excursion with hotel pickup and drop-off from your Siem Reap hotel as well as complimentary bottled water throughout the day. Escape the crowds of Angkor Wat and focus on two of Angkor Archaeological Park’s lesser-known temples—Ta Prohm and Banteay Kdei—on a full-day tour from Siem Reap. As well as revealing historical and cultural info that you may otherwise have missed, this tour includes a traditional Khmer massage and a buffet dinner accompanied by a traditional dance show. Plus, hassle-free hotel pickup and drop-off from your Siem Reap hotel are included. A spectacularly carved riverbed, Phnom Kulen mountain is set deep in the jungle to the northeast of Angkor. This tour is designed to bring our customers to all the fabulous temples in Angkor Park, beautiful waterfalls, local market, village schools & Tonle Sap Lake with its floating villages. This private tour ensures you won’t miss the sunrise over Angkor Wat. Set off in the comfort of a private vehicle from Siem Reap before dawn and be charmed by the early morning light. See other fascinating monuments in the UNESCO-listed Angkor Archaeological Park such as Preah Khan, Neak Pean, Ta Som, East Mebon, Pre Rup, and Banteay Samre. A four-day touring program to discover Cambodia’s highlighted city Siem Reap. This program is suggested for guests spending 3 nights or more in Cambodia. See the highlights including Angkor Wat, Angkor Thom, Ta Prohm, and even Zipline experience. With this Big Circle Tour, you'll spend a day exploring the most fascinating spots in the larger area surrounding Angkor Wat, including the world-famous sunrise and sunset. You'll avoid wasting time finding temples, because our drivers know the route well, which gives you more time sightseeing. Believe me, it will be hot all day with direct sunlight, so we provide 5-star service that relieves you with ice bottle water and icy cooling towels, bringing you full energy to explore the next temple. This is guaranteed to be the best touring service you can find. Beat the worst of the crowds to Angkor’s Big Three by starting early on this private tour. Traveling from your door to your door with a guide, watch the sunrise at Angkor Wat, visit the Srah Srang lake, explore the ancient city of Angkor Thom, including the Bayon Temple, and marvel at Ta Prohm, the “Tomb Raider” Temple. Upgrade for a 4-course breakfast; entrance fees are at your own expense. Spend a day visiting the most beautiful morning including amazing Angkor Wat. Avoid the crowd as possible this 8 hours visit the most beautiful temples in Angkor complex including Angkor Wat, Southgate of Angkor Thom, Bayon Temple - see beautifully crafted central towers covered in more than 200 enormous faces and exploring the maze-like interior of Ta Prohm Temple. Join this top-rate small group tour with a maximum of 10 people air-com minivan, explore the major temples on a compact time frame. Tap into your affinity for adventure on a small group full-day with sunset tour to discover Siem Reap's mesmerising sacred sites. Join your expert guide and embark upon an entire day of temple-hopping that lets you get up-close-and-personal with ruins dating back to the 12th century's Khmer Empire.Experience this top-rate small group tour with a maximum of 10 people air-com minivan, explore the major temples on a compact time frame.